Hybrid SACD (recorded in DSD; SACD Surround 5.0 / SACD Stereo / CD Stereo - playable on all SACD and CD players); booklet with liner notes in English and Finnish. Lyrics of Sinfonia included, Calmo with English translation. In Hannu Lintu's marvellous new recording I hear and admire a rediscovery of the impatience and invention that drove Berio to write it, in the forward, piano-led instrumental balance and the unapologetic grandeur of the finale's climax. The 5.0 surround experience is truly remarkable, and at times genuinely overwhelming. The performance is tremendously idiomatic and convincing. This production is an allround winner from beginning to end. (...)The loudest, most pinpoint radio orchestra on earth, conducted by Hannu Lintu and produced by Laura Heikinheimo. If you want to hear every note of Berio's Sinfonia, you couldn't find a better reference point. Ondine continues its exciting releases focusing on 20th century masterpieces together with conductor Hannu Lintu and the Finnish Radio Symphony Orchestra. After successful Ligeti (ODE 1213-2; Gramophone Editor's Choice) and Messiaen (ODE 1251-5) recordings a new album is released which is dedicated to orchestral works by the pioneer of Italian modernism, Luciano Berio (1925-2003). A highlight of this disc is Berio's iconic 5-movement Sinfonia, undoubtedly his most well-known work, written for the New York Philharmonic and dedicated to Leonard Bernstein. It has become one of the key works and principal musical manifestations of the 1960s bringing together collage technique and modernism. 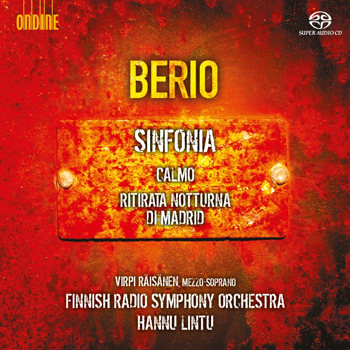 The recording begins with Berio's orchestral adaptation of Luigi Boccherini's popular Ritirata Notturna di Madrid. This disc also includes Calmo for mezzo-soprano and 22 instruments written by Berio after the death of a fellow composer and a friend Bruno Maderna. The work is sung here by mezzo-soprano Virpi Räisänen, a singer acclaimed for his performances of 20th century music and whose solo debut recording can be found on Ondine (ODE 1208-2).